Embrace the eclectic flavour profiles of the Med, with our delicious new issue. Prepare the grazing table, foodies, our brand new April/May issue is hot off the press. Dish magazine takes a bite of the Mediterranean with an issue dedicated to the flavours of this most delicious region. Try a little bit of everything in a sumptuous Eastern Med mezze feast, find comfort in the sustaining deliciousness of pasta and grains and settle down with a cup of coffee to savour Italian and Greek baked treats. In this issue, we look to our own backyard and get acquainted with the foodie folk who are bringing a slice of the Med to local shores. We venture to Waiheke Island with resident gourmand Julie Biuso, to discover what makes this little island paradise our very own European-inspired escape. Dish recipe creator Sarah Tuck gives our favourite breakfast staples a well-earned edit, while queen of green Kelly Gibney reivents the wheel with nutrient-rich pizza recipes. 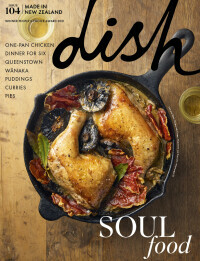 Dish is an award-winning bi-monthly magazine for people who enjoy cooking and reading about good food. We feature inspiring seasonal recipes and stories about food producers, issues and trends around food in New Zealand and overseas. Our recipes are beautifully presented and easy to follow, offering inspiration for both accomplished cooks and those keen to try something new. Our April/May issue will be available in store from Monday, March 19. To secure your subscription to Dish magazine, simply enter your details right here.